Jaguar will take the supersaloon fight to AMG and BMW's M Division later in 2012 with an uprated version of the XFR: the XFR-S. With tweaks cribbed from the range-topping XKR-S coupe, the XFR-S will get cosmetic, aerodynamic and powertrain upgrades to close the gap on Germany's bahn-storming finest. What is new on the 2012 Jaguar XFR-S? The bodykit is pretty serious - and we hear that what you see here is in finished production spec: the enormous rear spoiler with integrated brakelight is similar to the wing that adorns the rear of the XFR-S. A large rear diffuser completes the rearwards makeover - save for the boastful R-S badging, of course. And under the bonnet of the 2012 Jaguar XFR-S? Spot the theme here? The XFR-S will get the same powertrain as its XK sister. That means a 5.0-litre supercharged V8, upped from 503bhp to around 542bhp, and good for 502lb ft. That'll be enough to eclipse the standard XFR, which already hits 60mph in 4.7sec and will go on to 174mph when the Speed Pack equipped. Since the latest iteration of the German supersaloons opted for twin-turbocharging, the original 503bhp XFR has been left looking a little outgunned. The F10M BMW M5 pumps out 552bhp and the 5.5-litre E-class AMG with Performance Pack only lags slightly behind with 549bhp. A Porsche Panamera Turbo S is a 550bhp car - but at £123,776 before options, it's a good deal pricier than we expect the XFR-S to be. How much will the 2012 Jaguar XFR-S cost? Jaguar hasn't announced prices (or the car yet, officially!) but we can estimate that it'll retail for around £80,000; a standard XFR costs £65,380. The XKR-S range-topper commands a £18,500 premium over a standard XKR, and upping the XFR-S north of eighty grand would sit it smack in the middle of M5 and E63 AMG territory (£73,065 and £80,250 respectively). 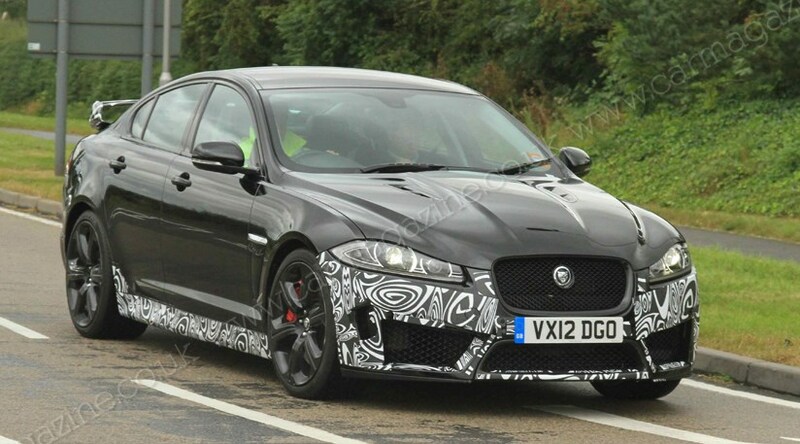 We'll see the new 2012 Jaguar XFR-S launched at the Los Angeles motor show in November 2012. >> Should Jaguar be chasing the German manufacturers in the power stakes? Sound off in the comments below!